Do citizen science efforts ever go beyond "feel good" contributions? Do the data get published in peer-reviewed journals? In an earlier post, I started a list of citizen science projects that allow students to make a contribution. Many commentors are graciously adding to that list and I thank you all! I'm glad to learn there are so many interesting projects and ways for people to get involved. Science is so empowering! My question today concerns things like outcomes and deliverables. We'd like to assume that good things are coming from citizen science because people are involved, but I don't know if that's really true and being a scientist, I want to avoid over-doing the assumptions. Does the research from citizen science ever get published? Last Wednesday, at the University of Washington, I learned about one such study. If you know of others, I'd love to see citations in the comments. One of my fantasies when I was a full-time college instructor was to figure out a good project where my students and I could collaborate and we could collect publishable data. This sounds easy, and there are plenty of projects out there now where students can do this, but when I was teaching, I had a hard time finding one that combined our learning goals with a chance to do real science. I did publish one paper (1) from our sequencing project, but I would have liked to do more. One of the papers that I always liked was a paper that combined ecology and microbiology. In this study, the authors enlisted girl scouts to go out in the woods and drop acorns in certain areas so they could learn more about Lyme disease (2). I know this was a serious study, but I can't imagining an army of little Red Riding Hood girls, skipping through the woods with GPS devices, dropping acorns from their baskets. Since then, I've been learning more about citizen science, sometimes combined with student projects, and it's made me wonder how often these efforts result in peer-reviewed publications. Do these studies get used for anything beyond education and entertainment? I haven't been able to find digital biology projects that involve citizen science, but last week, at the UW COSEE workshop, I attended a talk where Dr. Nathalie Hamel talked about her work, the contribution from citizen scientists, and a resulting publication. Figure 1. 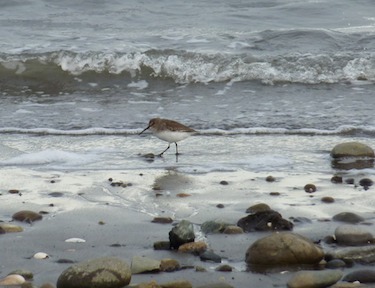 A sandpiper at Damon Point, on the Washington coast. Across the program, volunteers were able to identify carcasses correctly to the level of species and family 85% and 92% of the time respectively (present study). Fig. 2. 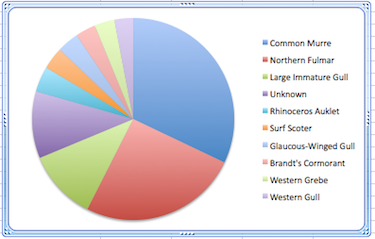 Species of dead birds identified by COASST, 1999-2008, data regraphed from COASST.